Tag line: "You never met a pair like Butch and The Kid"
In real life, Butch Cassidy and the Sundance Kid were hardened criminals who, along with their gang the “Wild Bunch”, robbed a number of banks in Wyoming, as well as the occasional train or two, until fate, and the Bolivian Army, caught up with them in 1908. For the 1969 movie based on their exploits, Butch Cassidy and the Sundance Kid, director George Roy Hill takes a rather unique approach to the story, giving the film an effectively comedic tone and, in the process, transforming the outlaws into a pair of charming misfits. 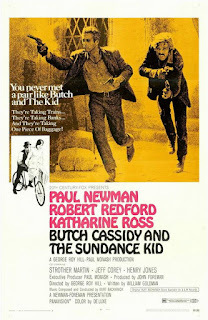 Butch Cassidy (Paul Newman) is the leader of the “Hole in the Wall” gang, a collection of outlaws that includes his closest friend, the Sundance Kid (Robert Redford). After a brief power struggle with Harvey Logan (Ted Cassidy), who tried to wrest control of the gang away from him, Butch and his cohorts make plans to rob the Union Pacific Railroad’s Overland Flyer not once, but twice, hitting it on its eastward run, then again on the trip back west. The first hold-up is a success, but during the second attempt, a group of lawmen turns up, causing the “Hole in the Wall” boys to scatter. This makeshift posse concentrates its efforts on apprehending Butch and Sundance, who, to evade capture, hop a boat bound for Bolivia, bringing Sundance’s girlfriend, Etta (Katherine Ross) along with them. Once south of the border, the pair decides to go straight, landing jobs as payroll guards, yet this proves only a temporary diversion from their life of crime. As the duo soon learns, however, the lawmen are just as persistent in Bolivia as they are in the United States, and perhaps a tad bit more ornery as well. Butch Cassidy and the Sundance Kid is a lighthearted, funny movie about two western outlaws fast approaching the end of their careers. 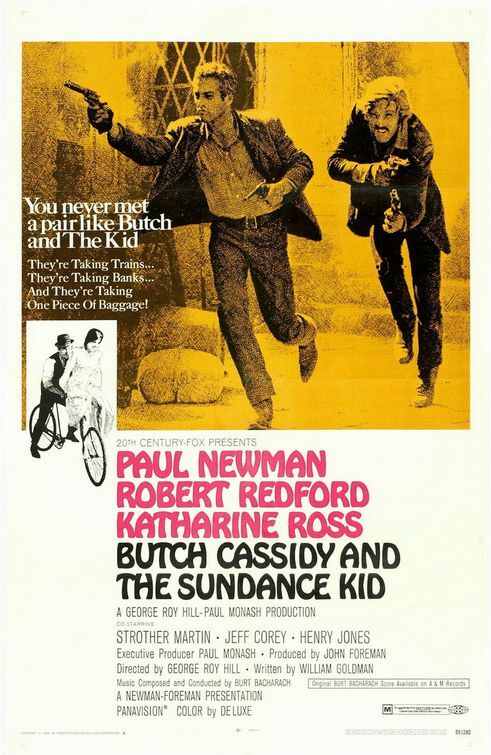 Butch and Sundance, played so well by Newman and Redford, are more like lovable oafs than lifetime crooks; one of the film’s most memorable scenes features Butch playfully riding around on a bicycle as Burt Bacharach’s Raindrops Keep Fallin’ on My Head fills the soundtrack. This scene would be out of place in most standard westerns, let alone one concerning a pair of real-life outlaws, but as the movie shows us time and again, Butch and Sundance weren’t particularly good criminals to begin with. When Butch squares off against Logan for control of the "Hole in the Wall" gang, we root for Butch to win, but at the same time realize Logan is making a pretty valid point: that Butch hasn’t been spending enough time with the gang, and, as a result, it lacks leadership. The duo’s incompetence also shines through when, during their attempt to rob the Overland Flyer, they try to dynamite their way into a baggage car and end up blowing it to bits because they used a few too many explosives. Sure, we like Butch and Sundance; with Newman and Redford as the leads, how could we not? Yet for most of the film, they're little more than endearing bumblers. Set around the turn of the 20th century, when the days of the untamed west were coming to a close, Butch Cassidy and the Sundance Kid has a lot in common with Sam Peckinpah’s The Wild Bunch in that its main characters are clinging to a way of life that’s quickly fading into obscurity. Yet where Peckinpah’s film was a dramatic, occasionally tragic account of men out of place in a changing world, Butch Cassidy and the Sundance Kid takes it all in stride, and that’s a big part of its appeal.